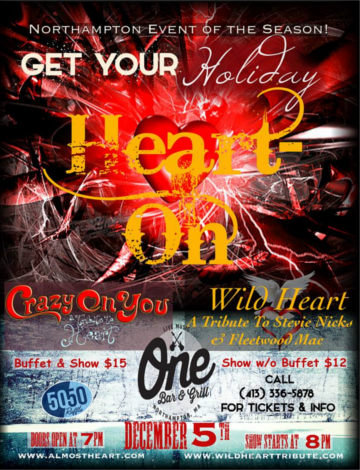 Crazy On You - A Tribute To HEART and Wild Heart - A Tribute To Stevie Nicks & Fleetwood Mac team up for an incredible show at the One Bar & Grill in Norhampton, MA dubbed "GET YOUR HOLIDAY HEART-ON"! This will be the most fabulous event of the season in Downtown Nothampton! Two tributes with all the holiday heart to give! There will be a finger food buffet starting at 7 pm and ending at 8:30 pm... Show with buffet is $15 and show without is $12... 50/50 raffle! Get Your Holiday Heart On! See you there!